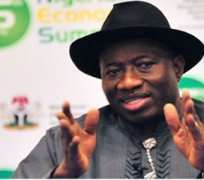 President Goodluck Jonathan on Thursday appealed to members of the National Assembly to expedite action on the 2014 Appropriation Bill in order to enable his administration to deliver dividends of democracy to the people. Jonathan made the appeal during a stakeholders' forum of the Subsidy Reinvestment and Empowerment Programme held inside the Presidential Villa, Abuja. Jonathan, who was represented at the SURE-P stakeholders forum by the Minister of Labour and Productivity, Chief Emeka Wogu, told the Chairman of the Senate Committee on SURE-P, to carry out the assignment of pleading with his colleagues on his behalf. 'Let me appeal to Senator Ningi who chairs the Senate committee on SURE-P to please help urge his colleagues in the National Assembly to expedite consideration of the 2014 budget which is currently before them in order for us to continue to deliver dividends of democracy to our people,' he said. He reiterated his administration's determination to continue to improve on the country's infrastructural needs. While saying that the SURE-P had since its inception in 2012 become a critical unit of his administration's transformation agenda, the President disclosed that over 190,000 youths had so far been employed in various categories. He said that the programme had also intervened massively in railway, road construction and health sectors. The Director-General of the Budget Office, Dr. Bright Okogu, put the Federal Government's share of the SURE-P's fund at N180bn per annum. Meanwhile, the House of Representatives on Thursday blamed its failure to debate the 2014 budget this week on the ongoing review of the 1999 Constitution. It said much of the week was devoted to voting on 19 new clauses proposed by the House to be added to the constitution. The spokesman for the House, Mr. Zakari Mohammed, said, 'We said last week that the budget debate would be on this week. 'There was an adjustment because we now took the constitution first; all of Thursday was used to vote on the new clauses. Mohammed dismissed speculations that tension between PDP and APC lawmakers over the control of the House leadership was responsible for their failure to debate the budget. He said, 'I have heard people say we didn't treat the budget because of disagreement between parties in the House. The Speaker of the House, Mr. Aminu Tambuwal, had during plenary announced that the debate on the general principles of the N4.6tn budget would start on Tuesday next week. - Punch.